Tuesday evening the Skirball Center announced the cancellation of "An Evening with Justice Ruth Bader Ginsburg," part of an ongoing exhibit by the Cultural Center titled: "Notorious RBG: The Life and Times of Ruth Bader Ginsburg." 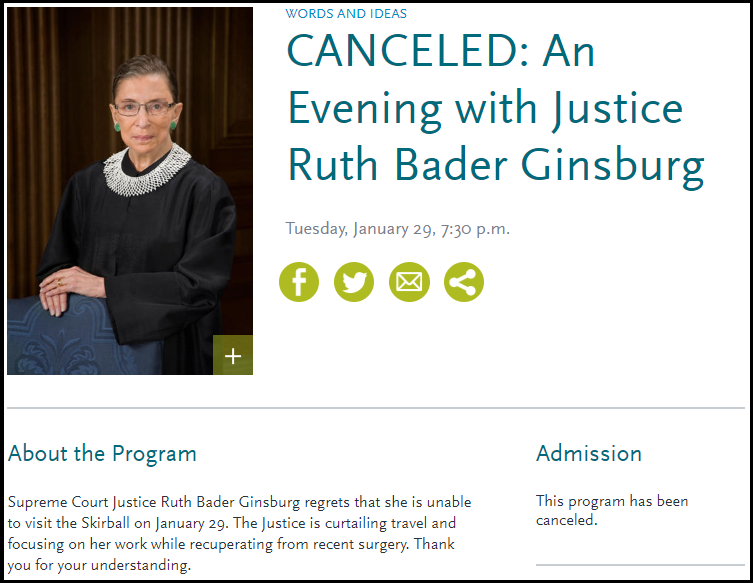 Update: An Evening with Justice Ruth Bader Ginsburg is CANCELED. The Justice regrets that she is unable to visit the Skirball on 1/29. She is curtailing travel and focusing on her work while recuperating from recent surgery. Thank you for your understanding. While her exact condition is unknown, "top cancer surgeons" told CNBC they expect the 85-year-old Justice to be back on the bench in less than six weeks after fracturing three ribs and undergoing surgery to remove two cancerous nodules from her left lung over a two-month span. Ginsburg's January 29 appearance was announced on December 20 - one day before her lung surgery. She was released from the hospital four days later. On January 7, Chief Justice John Roberts said Ginsburg was "unable to be present doay," adding that she would still participate from home. A court spokesperson said earlier that day that Ginsburg would participate in cases "on the basis of briefs, filings and transcripts." Ginsburg's absence from the bench - and now her late-January event cancellation, has stoked rumors over social media that the oldest Supreme Court Justice is actually dead, with doubters demanding proof-of-life under hashtags such as #WeekendAtRuths, a reference to the popular 1989 film Weekend At Bernie's. 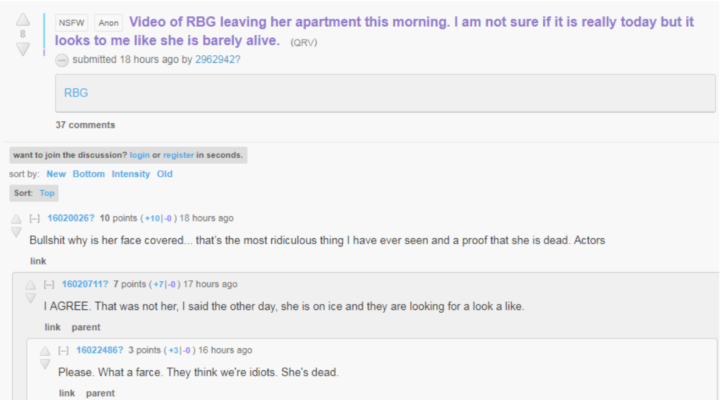 I know this is cruel, but sorry, we need proof of life in regards to Justice Ginsburg. It isn't beyond the Left, and Deep State, to hide that she passed on. She also must be coherent. To just claim she is working at home, is not going to cut it. Conspiracy avatar Qanon took things in a different direction, suggesting that doctors are giving Ginsburg "off-market" drugs "in order to sustain minimum daily function," asking "who is "really" managing her care?" and suggesting that there is "PANIC IN DC." The #DeepState needs her around as long as possible. "What 'off-market' drugs are being provided to [RBG] in order to sustain minimum daily function?" That said, video purporting to be Ginsburg emerging from her Washington D.C. apartment was reported by TMZ. This wasn't enough to satisfy some critics who pointed to the fact that you can't see her face in the video, as noted by the Daily Dot's Mike Rothschild. Whatever Ginsburg's current status, the prognosis for an 85-year-old who recently had two cancerous growths removed, and who has previously battled both pancreatic and colon cancer, can't be good. The only question; will she survive Trump?